As advances in genetics are becoming increasingly relevant to mainstream healthcare, a major challenge is to ensure that these are integrated appropriately into mainstream medical services. In 2003, the Department of Health for England announced the availability of start-up funding for ten 'Mainstreaming Genetics' pilot services to develop models to achieve this. Multiple methods were used to explore the pilots' experiences of incorporating genetics which might inform the development of new services in the future. A workshop with project staff, an email questionnaire, interviews and a thematic analysis of pilot final reports were carried out. 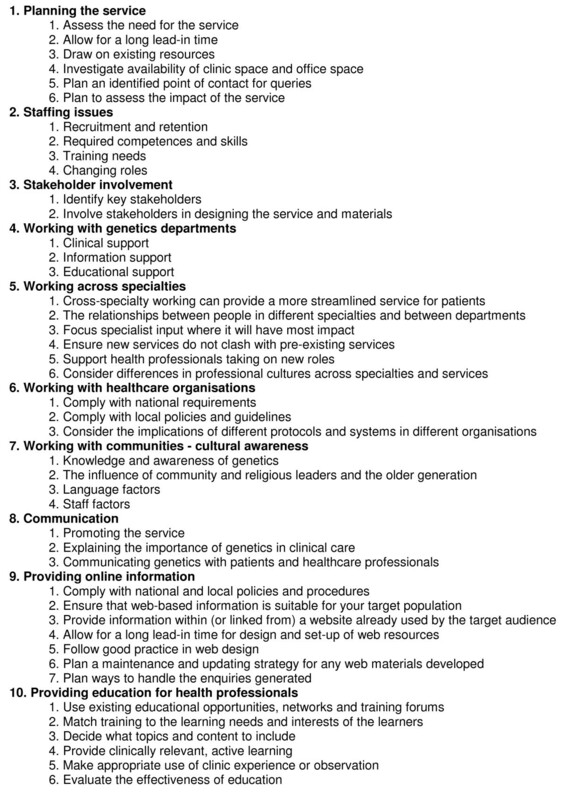 Seven themes relating to the integration of genetics into mainstream medical services were identified: planning services to incorporate genetics; the involvement of genetics departments; the establishment of roles incorporating genetic activities; identifying and involving stakeholders; the challenges of working across specialty boundaries; working with multiple healthcare organisations; and the importance of cultural awareness of genetic conditions. Pilots found that the planning phase often included the need to raise awareness of genetic conditions and services and that early consideration of organisational issues such as clinic location was essential. The formal involvement of genetics departments was crucial to success; benefits included provision of clinical and educational support for staff in new roles. Recruitment and retention for new roles outside usual career pathways sometimes proved difficult. Differences in specialties' working practices and working with multiple healthcare organisations also brought challenges such as the 'genetic approach' of working with families, incompatible record systems and different approaches to health professionals' autonomous practice. 'Practice points' have been collated into a Toolkit which includes resources from the pilots, including job descriptions and clinical tools. These can be customised for reuse by other services. Healthcare services need to translate advances in genetics into benefits for patients. Consideration of the issues presented here when incorporating genetics into mainstream medical services will help ensure that new service developments build on the body of experience gained by the pilots, to provide high quality services for patients with or at risk of genetic conditions. Genetics is increasingly widely relevant to mainstream healthcare [1, 2]. Patients with or at risk of heritable conditions are cared for across health services and advances in the prevention, diagnosis, treatment and management of single gene disorders, as well as in our understanding of the genetic component and familial implications of common diseases, mean that services for patients may be enhanced by integrating genetic activities into clinical practice [3–7]. In the UK, specialist genetics services are organised regionally and provided by Consultant Clinical Geneticists and Genetic Counsellors, in close collaboration with specialist laboratories, in Regional Genetics Centres (RGCs) . However, as genetics becomes increasingly relevant within an area of practice, new 'genetic' services need to be developed and integrated. For example, as our understanding of the role of inheritance in certain types of cancer has increased, cancer family history clinics have been established . Through its 2003 Genetics White Paper, "Our inheritance, our future - realising the potential of genetics in the NHS [National Health Service]" , the Department of Health for England (DH) provided two years start-up funding for ten pilot service development projects, which they termed 'Mainstreaming Genetics'. These pilots were established to explore the various aspects of this genetic integration that would be important for overall success and to develop innovative service models. In establishing new services, the pilots developed new roles, new patient pathways and new ways of working. They gained considerable experience of how to integrate genetics into mainstream healthcare services. The NHS National Genetics Education and Development Centre , also established through the Genetics White Paper, was given the remit to support the pilots and to disseminate their experiences of integrating genetic activities into other mainstream medical services to the wider NHS. The DH also funded an external evaluation team who worked with the pilots to explore the effectiveness of the service developments . This paper explores the challenges faced by the pilots, the factors that contributed to the successful integration of genetic activities into mainstream medicine and the barriers they faced establishing new roles and services so that those developing future services can build on this experience. The ten 'Mainstreaming Genetics' service development pilots covered a range of genetic conditions, clinical specialities and service models, including: setting up or enhancing multidisciplinary clinics; delineating integrated care pathways and referrals; and providing education for either other health professionals or service users and the community (Figure 1). Pilot services are listed in Table 1. Multiple methods were used to collate the key experiences of the pilots that might inform future service developments. Advice from the Central Office for Research Ethics Committees (COREC) indicated that ethical committee approval was not required for this service development work. Overview of pilot services: main themes. As the initial two year funding period was ending, representatives from all the pilot services were invited to attend a one-day workshop to: describe the new roles developed for their services; outline the genetic activities and competences required for their service; discuss their experiences of what was involved in establishing new genetics services in mainstream medicine; share information on any resources used or developed; and explore any gaps in support for their service developments. Key points raised at the workshop were used to inform the development of a questionnaire which was sent by email to all ten pilots approximately one month after the workshop. The questionnaire asked about: their experiences of developing substantive new roles; implications of service developments for genetics departments; important factors for developing successful services; barriers to success; formal learning and resources developed by the new service or used to support the pilot; and gaps in provision of support. The questionnaire used a combination of 5-point Likert type responses (1 = low to 5 = high) and free text boxes. Where pilots were unable to complete the questionnaire, a face to face interview covering these issues was offered as an alternative. Each pilot produced a final report for the DH and some of these were made available to the team. A thematic analysis of those final reports that were available was carried out. One member of the team generated an initial list of themes which was then discussed within the team and amended until agreement was reached. Data from these different sources were triangulated to identify key issues that should be considered when planning service developments for genetics in mainstream medicine. There were ten pilot service developments. Eight people representing seven of the pilots attended the workshop. Seven pilots returned questionnaires and staff from two others were interviewed. Six final reports were available for analysis. All pilots except one provided two or more sources of information. From the range of data sources, seven key themes emerged relating to the integration of genetic services into mainstream healthcare. These are explored in turn below. The pilots identified a number of challenges in planning services to integrate genetics, including: demonstrating the need for new services; timescales and lead-in time; organisational issues such as clinic space; staff skills and awareness of genetics. Assessing and demonstrating the need to incorporate genetics into mainstream medical specialties was identified as a major issue by the pilots as these were new services, breaking new ground and often crossing traditional professional and specialty boundaries. Patient satisfaction questionnaires, focus groups, feedback from education sessions, review of the published literature, retrospective audits of practice and reviewing referral data were all reported methods which provided evidence to support the need for new co-ordinated or integrated services for patients. This pilot service addressed the issue by developing a letter explaining what the person could expect from the appointment. As pilot services engaged healthcare professionals from other specialties, some found it was important to assess their core genetic skills and the need for support tools such as referral pathways, guidelines, trigger lists and protocols, during the planning phase. Pilots stressed the importance of drawing on existing resources and expertise, including, for example, adapting existing documentation and drawing on existing expertise within the organisation (for example, for the development of websites and patient information). Where information about a service was disseminated online, pilot services suggested provision of information within, or linked from, a website already used by the target audience, such as the local PCT, hospital or genetics department websites. The pilot services stressed the importance of the formal involvement of their Regional Genetics Centre at an early stage in the development of new roles and services delivered in other specialties. Identified benefits included the provision of clinical and educational support for staff in new roles, for example, opportunities to attend clinical meetings, supervision and assessment of clinical work, input into the development of information resources, and providing education sessions for service staff and other health professionals. Another pilot described supported development of the new role, with structured transition from observation of genetic counselling sessions, to supervised practice for six months, before formal assessment and then independent practice. The pilots identified a number of issues focussing on the development of roles integrating genetic activities, recruitment and retention of staff and their training. Table 1 shows the substantive new clinical roles developed for each pilot. These either involved a nurse specialist in a mainstream specialty undertaking work in genetics in that specialty, or, in some cases, a genetic counsellor (GC) developing additional skills and working mainly outside the specialist genetics service. In some cases an additional GC role was created to co-ordinate or provide education for the specialist nurses. Where the focus of the service was on additional work in the community, this usually involved development of a GC role. Strategies adopted by pilots included secondments and sharing posts with other services. Staff retention was also important: as shown in Table 2, disruption from changing staff was an important barrier to success for some pilot services. Open comments revealed that staff changes and sick leave caused major disruption to service provision, especially in new roles where extensive initial training was required. In new and innovative roles, where there is no clear career pathway, perceived lack of opportunities for professional development and promotion may have an impact on staff retention. Career development and access to training and support were both rated important by pilot services (Table 4), who also highlighted the importance of identifying training needs, providing protected time and funding for training, providing opportunities for staff to gain formal qualifications or accreditation and involving regional genetics centre staff in training and development. The pilots suggested that it was particularly important to secure the involvement of relevant stakeholders when planning and designing services. They explored different approaches to stakeholder involvement. It was also important to engage healthcare professionals in order to raise awareness of the new services, encourage buy-in and ensure knowledge of how to access services. For some services, engagement with patients and the public was important in order to improve equity of access to services from particular groups, such as minority ethnic groups who have previously been under-represented as genetics service users. Pilots reported that stakeholder involvement could be difficult to achieve, one questionnaire respondent describing it as: "A one-person mission at times". Identifying relevant stakeholders was seen as an important step, and for the pilots these included patients, community members, senior managers, clinical personnel, representatives of relevant organisations and representatives of educational groups. Understanding how partner organisations work and using established networks to make contact were recommended by pilot services (Table 4). Methods of stakeholder involvement included face-to-face meetings, questionnaires and focus groups. Stakeholders were involved in planning and design of services and service documents, and in providing feedback on leaflets, website content, clinical protocols and tools. The report from this pilot service development advised other services to devote time and energy to understanding the existing culture of the specialty and of the practitioners' professions. Communicating information about genetic services using clear language and not assuming prior knowledge were therefore vital. Recommendations for the provision of education to health professionals to support genetics services included matching training to the learning needs and interests of the learners, demonstrating the relevance of genetics to the participants' practice and integrating sessions into existing educational networks. Pilot services reported that face-to-face explanation of new services or roles can promote understanding and uptake, and two pilot reports describe how services developed from existing informal relationships between interested clinicians in different specialties. The assignment of one specific line manager for each practitioner was also considered important (Table 3) as working with different specialties and Trusts could lead to involvement of multiple managers and to potential conflicts. The pilot services often involved working with multiple healthcare organisations. Their experiences highlighted the importance of considering the differences between these organisations and of identifying relevant national and local policies and guidelines at an early stage. National requirements might include National Institute for Health and Clinical Excellence (NICE) guidelines for particular conditions such as familial breast cancer  and familial hypercholesterolaemia , relevant National Service Frameworks, and the UK Genetics Testing Network (UKGTN) for genetic testing . Local policies and guidelines will exist for a range of developments, such as patient information, websites, protocols and approvals for setting up clinics, honorary contracts and research governance. The existence of different policies, guidelines, protocols and systems within different organisations proved problematic for some pilot services which operated across specialties and across Trusts. For example, services had to accommodate different systems for clinical notes and medical records, consent procedures, ordering investigations, testing and reporting procedures, and patient registration. Different electronic record systems were sometimes unable to communicate, resulting in multiple copies of records and duplication of work. Table 4 shows that all seven respondents indicated that access to data across other departments, such as family records, was of high importance to the success of new services. Some of the pilots were concerned with raising awareness of genetic conditions and genetic services within local communities in order to improve access to services. The report also highlights the influence of community and religious leaders, for example, on beliefs about inheritance, which can influence whether people access genetic services. Approaches to improving genetic literacy within communities developed by the pilots included: employing a genetic link worker to work in a specific community; using bilingual information resources; using the media, such as community radio shows and community newsletters; working with influential members of the community; and distributing information at community events. These themes represent key issues which may need to be considered by clinicians, managers and commissioners when incorporating genetics into mainstream services. The 'practice points' have been collated into an online 'Toolkit', outlined in Figure 2 and available in full from the NHS National Genetics Education and Development Centre's website . The online Toolkit also includes resources from previous service development initiatives, such as job descriptions and clinical tools, which can be customised and reused in new service developments. A Toolkit for developing services for patients with or at risk of genetic conditions. The full Toolkit with customisable resources is available online at http://www.geneticseducation.nhs.uk. Advances in genetic science are being translated into changes in clinical care for patients. More genetic tests are becoming available for disorders in many specialties. For example, more than 50 inherited cardiovascular conditions have now been recognised and genetic tests are available for some of the more common (e.g. familial hypercholesterolaemia) as well as some of the rarer conditions . The organisation and delivery of health services is also changing more generally. For example, in England, the NHS plan outlined a "vision of a health service designed around the patient"  and the 'Darzi Report' described how the challenges of the 21st century, such as, "rising expectations; demand driven by demographics; the continuing development of our 'information society'; advances in treatments; the changing nature of disease; and changing expectations of the health workplace", would be met . Thus the development of new roles and services incorporating genetics is occurring in the context of change and modernisation of health services as well as advances in genetics. Specialist genetics services work closely with a number of specialties to provide co-ordinated patient care and initiatives such as joint clinics have been established (see for example [20–22]). New opportunities for patient care arising from developments in genetics mean that service developments are bringing together different provider organisations, professions and specialties, to develop new roles and services which cross traditional professional boundaries and cultures. This raises a number of challenges which were faced by the 'Mainstreaming Genetics' pilots in planning and developing their new services. Issues of 'ownership' included commissioning and funding of services as well as management of services and staff and physical location, acceptance by staff from other specialties and the importance of formal backing of all stakeholders, including the genetics department. The development of new roles for health professionals in response to the changing needs of patients is not unique to integrating genetics. For example, General Practitioners in England are being encouraged to develop expertise of a more specialist nature through the development of General Practitioner with a Special Interest roles (GPwSIs) . GPs developing specialist roles face a number of challenges, including workload issues, the need for trust from colleagues and patients and good links with the relevant secondary care specialty . The experiences of the 'Mainstreaming Genetics' pilots indicate similar challenges: in gaining and integrating specialist knowledge from two clinical areas, in developing new career pathways, and in establishing integrated and accepted services. As the pilots experienced, the challenges of establishing new roles must be overcome for the development of services to be successful. The pilots demonstrated the need to consider the necessary genetics skills and training of staff at an early planning stage, as well as throughout the life of the service. A low level of knowledge of genetics - in society and health professionals - was identified as a key barrier to success. Providing clear information about the service, its aims and benefits, supported by targeted education where appropriate, were found to be essential to gaining buy-in from senior colleagues in organisations as well as from patients and referring health professionals. Competences in genetics for health professionals who are not genetics specialists have since been developed in the UK by Skills for Health working with the NHS National Genetics Education and Development Centre and can be used in defining roles and developing services, and in determining and meeting educational needs . The need to raise awareness of genetic conditions and services within communities in order to improve access to genetics services is an issue which has been highlighted internationally (see for example  and ). Some issues were raised by the familial implications of genetic conditions. Within most specialties the focus of care is on the treatment of an individual presenting patient. However, within the specialty of genetics there can be a need to consider the wider family . When services are developed for heritable conditions in other specialties, this 'familial' emphasis can demand a shift in thinking for health professionals. The pilots also identified important 'systems' implications of a 'genetic approach', for example, data systems were sometimes unable to save family history information or to link members of a family. Issues of confidentiality and consent for sharing family information  were also raised. As our understanding of the role of genetic factors in health and disease increases, new services, new roles and new ways of working need to be developed to translate these advances into benefits for patients. 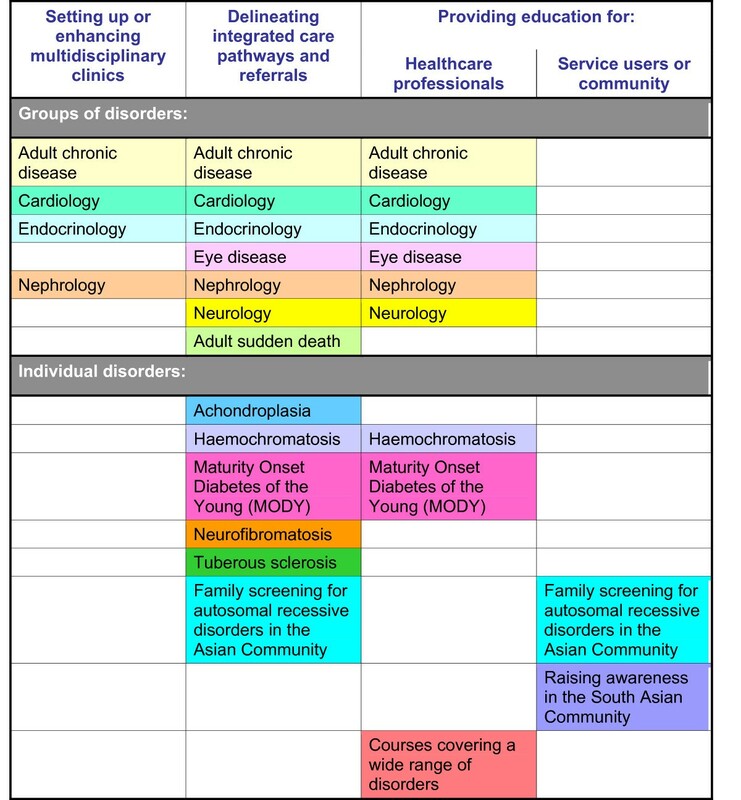 The key themes presented here represent the combined experiences from a range of genetics service developments, in different areas of mainstream medicine, for different genetic conditions and implementing different service models. Many of the new roles and services developed crossed traditional specialty boundaries and brought together different professional cultures. In establishing new services, the pilots defined and tackled key questions for health services: what genetic activities are needed for patient care, who will carry out these genetic activities, how will services be organised and what training, education and support are needed for staff in new roles and delivering new services? They identified some important factors for successful integration of genetic activities within other mainstream medical specialties: working with specialist genetics services to plan and provide clinical and educational support for new roles; understanding the working practices of all specialties involved; identifying key stakeholders, including senior management, relevant health professionals and patients, and involving them at an early stage; demonstrating the importance of genetics and sometimes improving the genetic literacy of health professionals, patients or the public in order to improve use of services. Providers of healthcare will need to continue responding to advances in genetics as applications to patient care increase. It is important that the experiences from previous genetics service developments are distilled and recorded to prevent the need to 'reinvent the wheel'. Consideration of the issues outlined here will help ensure that the next generation of service developments incorporating genetics into mainstream medical services builds on this body of experience, facilitating the development of high quality services for patients with or at risk of genetic conditions. United Kingdom Genetics Testing Network. The authors thank participants from the service development pilot projects for sharing their experiences and sharing educational and other materials developed. The study and manuscript preparation were funded by the NHS National Genetics Education and Development Centre, which is funded by the Department of Health and Welsh Assembly Government. The authors carried out the study and publication independently without involvement from the Department of Health or Welsh Assembly Government. PF and HB conceived of the study, participated in its design and were involved in revising the manuscript. CB participated in the study design, data collection, analysis, interpretation of data and was involved in drafting the manuscript. SB participated in data collection, analysis, interpretation of data and was involved in drafting the manuscript. All authors read and approved the final manuscript.